Website and processes: 4 Nov 16 Pari, 4/5 Good "Thank you for all the help. Unfortunately could not return to the call earlier. Much appreciated "
After a safety and ground briefing you will take to the skies for this full 1 hour flight. 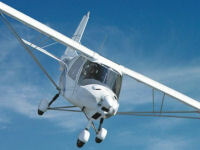 Once airborne you will be offered the chance to take the controls and fly the aircraft for yourself. After a warm welcome from your instructor you will receive a thorough safety and ground briefing on the main flight controls and their primary and secondary effects. Then it is time for the walk round the aircraft - the C42 is one of the most popular microlight training aircraft in the UK. Once you are safely strapped in and the engine is warmed up you will be taxiing out to the runway for your first flight. Once airborne your instructor will demonstrate the controls and once flying straight and level it's your turn to 'take control'. All too soon it will be time to return to the airfield and hand back control for the landing.